The Perfect Suit – Combination for Shirt, Shoes and Accessories! A Complete Style Guide To Suit Up! The basic suited look comprises of black suit jacket over a white shirt with black formal pants in the bottom. You will have the shiny polished black oxfords, black socks and a black tie or bow-tie. The watch will be black leather watch and all your cuff links or other metal accessories will be silver. However, generally speaking you will wear a more friendly shade of suits and here are the rules that go along with these shades! For this suit your dress shirt can be white but also salmon, blue (light) and lime are great options. The tie will be dark to match your grey suit and your footwear, belt and watch will be in brown leather. You may go for black if the dress shirt is black but it is always a better look with brighter colors. Your brown suit may be a classic look with dark brown shade or be a bit more zesty in a lighter shade. Brown can pull of beige, lime and mint very well as dress shirt shades. Your shoes, belt and watch will be in brown polished leather and brown suits are always a tad bit cooler with a pocket square. 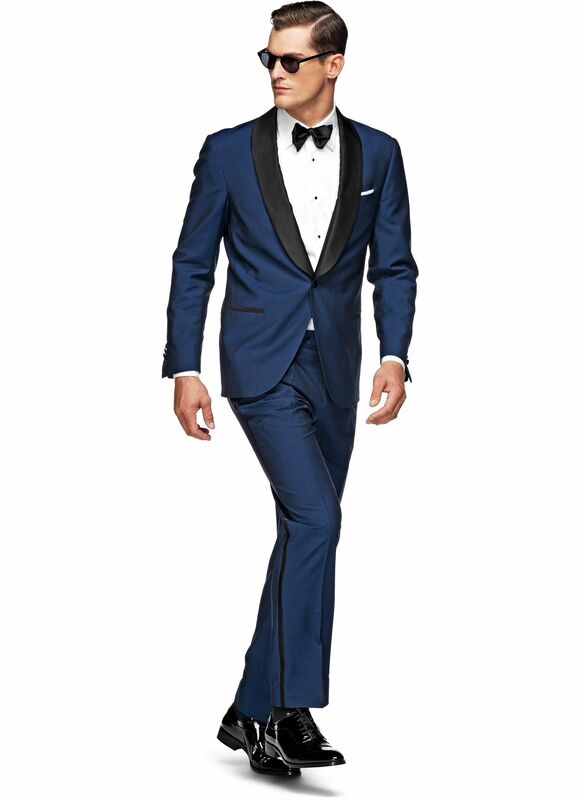 Navy blue is the perfectly true blue suit that each one of you needs for the royal look. Because one can never wear enough of blue, a mint shirt is a great combination for this suit. White also sits really well with it. Your footwear, belt and watch combination must be black leather and all your cuff-links should be silver toned. Silver is the theme for a navy blue suit. Beige suit is 4th in line in terms of preference because it is more like a style statement than a formal look. This suit is a neat style statement and a very elegant look especially for work or any daytime events. You will obviously go for brown leather shoes and watch along with brown belt. Your shirt can be white or chocolate brown. You should opt for a waistcoat for this shade because it is a classic look. Royal blue and maroon are the suits with a kick. They are for fancy formal parties and occasions. Both will be paired with black shoes, belt and watch. Also the shirt for maroon can be black. For the royal blue you should go for a white shirt but you may alternately switch to black as well. Go all out with lapel pins, pocket square and even strong cufflinks game because these suits for a fancy style statement! Burgundy Suit – Where To Wear! Share it with 3 people you know may need this right now! Know The Difference – Flight Jackets, Waxed Cotton Jackets & Wool Car Jackets!